Oliver, a photo by The Bacher Family on Flickr. Anyone who knows what's been going on in my life this month will understand why I've fallen behind on my photo blog. I'm hoping to be able to catch up now... Here's a start. I took this photo of my sister's new cat, Oliver, as a demonstration of my favorite lens, a 50mm f/1.4 "prime" lens. I love the way it focuses on just a narrow sliver of depth of field, in this case, Oliver's beautiful eyes. 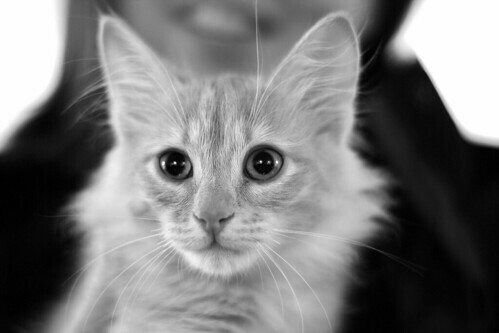 I chose to convert the image to black and white because that emphasizes texture, in this case, the fur and whiskers.